The decade has not been kind to Iowa Democrats in electoral politics. The party lost the governorship, office of secretary of state, and state house in 2010, a U.S. House seat in a rare incumbent vs. incumbent matchup after reapportionment in 2012, the state senate and a U.S. Senate seat in 2014, and the presidential election in 2016. But the 2018 cycle is looking rosier for Democrats with the prospects of picking up several state legislative seats, at least even odds in winning the governorship, and what now seems to be a chance to put an end to one of the longest Republican congressional streaks in the nation. Heading into the home stretch of the 2018 cycle, Iowa Democrats were already favored to pick up one seat (held by two-term 1st CD U.S. Representative Rod Blum) and in a dead heat in another (that of two-term 3rd CD Representative David Young). And while the odds of the 4th CD incumbent’s political demise may be greatly exaggerated, the Democratic electoral map has expanded to now also seriously target eight-term Congressman Steve King. Polling in the western Iowa congressional district has been understandably scant considering King won the +11 GOP district by 22 points last cycle, but Scholten’s impressive fundraising and a (Democratic) poll showing the challenger within a single point of King has put the race on the national radar in the 11th hour. All this raises the possibility of a Democratic sweep of all four U.S. House seats in Iowa – a sweep the party has not achieved since 1850, a half-decade before the founding of the Republican Party. To be sure, the Republican Party has dominated Iowa politics for the vast majority of election cycles since the mid-1850s. Dating back to the Election of 1856 – the cycle in which Republicans fielded a full slate of U.S. House nominees in the state – the GOP has won 534 of 655 general and special elections to the chamber (79.9 percent). Republicans have won at least one seat in each of these 81 election cycles – a streak that could come to an abrupt end with a three-seat Democratic pick-up in the state next week. 1964 (3rd CD): Eight-term Congressman Harold Gross eked out a 0.2-point victory against Waterloo attorney Stephen Peterson. Democrats won the other six contests. 1974 (3rd CD): In the open seat race following Gross’ retirement, state Representative Chuck Grassley defeated 25 year-old attorney Steve Rapp by 1.7 points. Democrats won the remaining five congressional elections. Republicans have only won two seats in eight other cycles. During three of these the state delegation was only two seats (1856, 1858, 1860) plus the Elections of 1976, 2006, 2008, 2010, and 2012. Following reapportionment in 2012, Iowa has only had four seats in the chamber – the state’s lowest level since 1860. 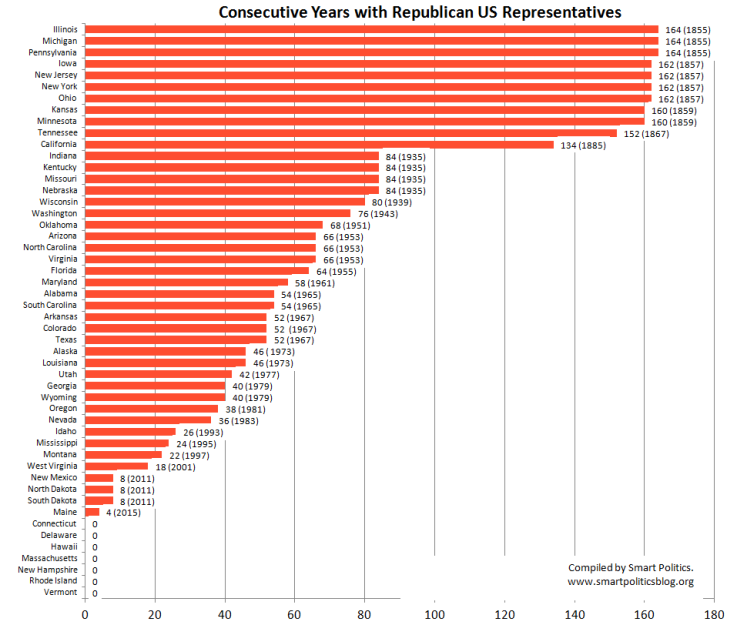 Overall, Iowa’s streak of having continuous Republican representation in the U.S. House since the 35th Congress in 1857 is the 4th longest streak in the nation. The Republican Party officially formed in July 1854 at its first state convention in Jackson, Michigan. The party was not organized in several states for the 1854 cycle and opponents of the Democratic Party also ran under various political banners such as Anti-Nebraska, People’s, and Whig with another competing faction – the American Party (Know-Nothings) – also winning dozens of seats. In elections to the 34th Congress in 1854, Republicans did win seats across some Midwestern and Northeastern states such as Illinois, Indiana, Maine, Michigan, Pennsylvania, and Wisconsin. [Vermont also elected a Republican to the 34th Congress – though in a special election in December 1856]. However, only three of those states have continuously elected at least one Republican to their U.S. House delegation over the last 160+ years: Illinois, Michigan, and Pennsylvania. Indiana saw its GOP streak end in 1912, Wisconsin in 1934, and Maine in 1966. Since the 1856 cycle, when the Republican Party became well-established in most states outside of the Deep South, four other states have notched an uninterrupted streak of Republican U.S. Representatives ever since: Iowa, New Jersey, New York, and Ohio. While New Jersey Republicans might endure their worst cycle in U.S. House races in more than a century, only Iowa might see its streak come to an end this November. One other state, Kansas, has had a continuous Republican presence in the chamber since achieving statehood in January 1859 and only three others have elected at least one Republican U.S. Representative in every cycle since the 19th Century: Minnesota, Tennessee, and California. Minnesota seated two Democrats to the 35th Congress after statehood in May 1858, but has elected at least one Republican ever since. [The Gopher State has actually voted for at least two GOPers in every cycle with the exceptions of 1868 and 1890]. Tennessee, meanwhile, owns the record for the longest Republican U.S. House streak in the South at 150+ years with the state electing an all-GOP delegation to the 40th Congress in 1866 – the first full cycle after being readmitted to the Union after the Civil War. California, meanwhile, has had at least one Republican in its delegation since 1885 – one cycle after Democrats swept the state in the 1882 congressional elections. Seven states currently have no Republicans in the House of Representatives – Connecticut, Delaware, Hawaii, Massachusetts, New Hampshire, Rhode Island, and Vermont. Republicans have lost a record 110 consecutive elections in Massachusetts, a record 25 in a row in Connecticut, and 24 in a row in Rhode Island. 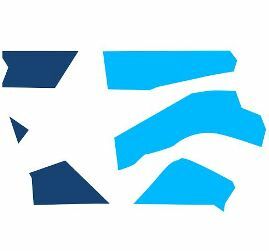 Iowa Democrats swept the state’s U.S. House races during its first four election cycles after statehood, last doing so in the Election of 1850. Previous: Chuck Grassley: Win One for the…Grim Reaper? 2 Comments on "Iowa Democrats Make Run At History in 2018 Congressional Races"
“…opponents of the Democratic Party…” The Whig Party, which fielded presidential contenders from 1836 through 1852 (plus ’56 as an ex-major party), formed the MAIN opposition (as opposed to People’s, anti-Nebraska, et. al.) to the party of Jefferson (“Democratic-Republicans”) & Jackson (“Democrats”), having produced FOUR presidents, two of them elected. Indeed, shortly after the 1854 “off-year” elections, the party once led by Henry Clay and Daniel Webster rapidly fell apart, with its former adherents joining the Republican party, the Native American “Know Nothing” party, the Constitutional Union party, and even the Democratic party, depending on region or ideology. Correction: The Whig Party ended up not fielding a presidential ticket of its own in 1856 (endorsed a former member of the party, Millard Fillmore).